The FIA has tweaked LMP1 rules for the inaugural year of the World Endurance Championship in a bid to allow Toyota to challenge Audi for the manufacturer's title. The new regulations state that only the highest finishing car in LMP1 will score manufacturer points, while only the six best scores - the Le Mans 24 Hours must be included - will count. 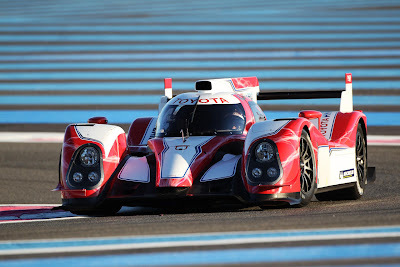 The regulations are designed to foster competition between Audi and Toyota, which was persuaded to step into the breach and expand its attack in 2012 following Peugeot's immediate withdrawal from sportscar racing on the eve of the WEC entry deadline. Toyota will still miss the opening round in Sebring, but will fight with Audi from Spa onwards. FIA WEC boss Gerard Neveu said the changes had been agreed by all parties in the interests of boosting competition. "The changes were requested following the withdrawal of Peugeot from the FIA World Endurance Championship last month and were agreed by all parties," Neveu explained. "The changes will allow Toyota, who have brought forward their participation in the championship to round 2 in Spa, to fight with Audi for the inaugural World Endurance Championship Manufacturer's title. "These changes to the regulations will certainly make the 2012 season more exciting for both teams and spectators alike." The changes were agreed by the FIA Endurance Commission and ratified by the FIA World Council. The regulations for the driver's championship, and for all other disciplines, remain unchanged.